"Three generals and a brigadier-general were among 31 troops killed in a bomb attack that caused a building in the army transport base in Harasta to collapse,'' Syrian Observatory for Human Rights director Rami Abdul Rahman said. 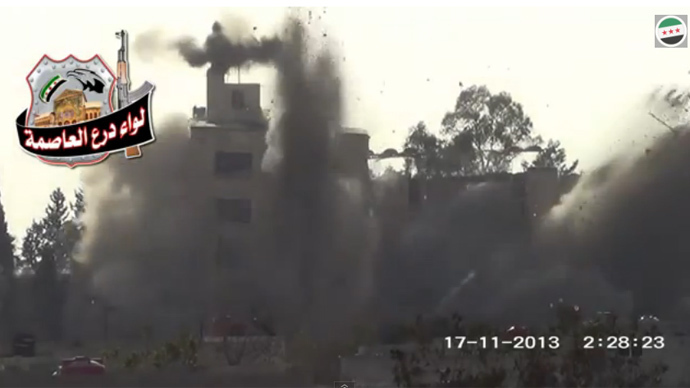 The rebel group Direh al-Aasmeh (Shield of Damascus) brigade - which is part of the Western-backed Free Syrian Army - has claimed responsibility for the attack, posting a video of the blast on YouTube. The video shows the military building collapsing. "The timing of the attack is significant” since government troops have only just regained several rebel strongholds in the area, Rahman added. The government forces were reportedly in the midst of an offensive in the town of Qara, located north of the capital near the border with Lebanon. “Warplanes bombarded the town heavily yesterday (Saturday). Regime troops are trying to storm it and to drive the rebels out,” Rahman said. "There is speculation that rebels could have infiltrated the military base, as the explosive device was probably placed "either inside or beneath the building in a tunnel,” he continued. Ukrainian journalist Ankhar Kochneva confirmed the attack on her blog. Kochneva was in Harasta when she heard the blast and felt the building she was in shake. She described the blast as a very large one, with many dead and wounded. The two-year conflict has already killed more than 100,000 people and displaced more than one million refugees. Syria’s economy has lost an estimated US$100 billion during the war - the equivalent of two years of normal production, according to Syrian Deputy Prime Minister Qadri Jamil. Moscow and Washington say they are committed to bringing both sides of the conflict to the negotiating table at the Geneva-2 peace conference. An earlier set of talks in Geneva broke up last year after just one day.